Whether you’re in the market for a new patio for your home or you need pavement striping for your business in Waco and Temple, TX, the experts of eSquared Asphalt Maintenance have you covered. Our skilled technicians can complete any concrete installation, repair, or restoration project easily and within the compliance guidelines set by the EPA and ADA. Call us today to schedule your consultation at 254-716-8685. Our experts are seasoned and trained to complete all of your concrete striping and marking requirements quickly as accurately to minimize business interruption. We follow code and guidelines requirements and updates to ensure that you’re never left holding the match at the end of our services. We provide all lining and marking services including interior and exterior striping, handicap striping and logo painting, and fire lane painting. When you need reliable pavement striping in Waco and Temple, TX that lasts, call our professionals first. Along with our first class pavement striping services, we provide extensive concrete installation, repair, and restoration services that can revive and re-energize any construct. From driveway repair to walkway installation, our team can guide you through your project and deliver useful information about material benefits, costs, and lifespan so you always get exactly what you want. Our specialists can even provide specialty concrete decoration and stamping for a completely customized and unique look. When you need your surfaces cleaned, our professionals can provide pressure washing techniques that are strong enough to eliminate mold and mildew, yet gentle enough to use on softwood surfaces. For all of our concrete needs, our team is standing by to help. Call us at 254-716-8685. No matter what type of concrete or asphalt project you need to be done, our experts can complete it to your complete satisfaction and within the safety and environmental guidelines. 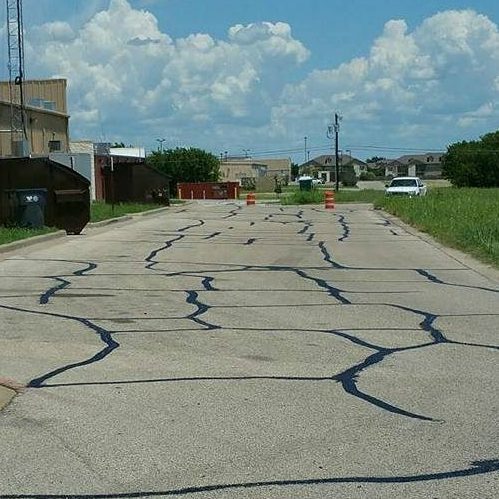 For all of your concrete maintenance and pavement striping needs in Waco and Temple, TX, call our team of experts first and get the job done right. Updated on March 21, 2019 at 10:36 am by eSquared Asphalt Maintenance.